University Testing Services (UTS) helps advance quality and equity in education by providing fair and valid testing assessments and related services to university students and the surrounding community. 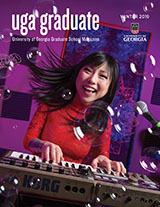 A member of the Division of Student Affairs, UTS supports the academic, personal and professional growth of students enrolled in the University of Georgia. UTS is a comprehensive testing center providing individual testing services by appointment for Foreign Language and Chemistry Placement, Independent Study and academic exemption exams. Walk-in and group testing is available for departmental profiles including Terry College of Business, Grady College of Journalism, and Housing and Consumer Economics. Several ETS (Educational Testing Services) program exams are administered through this office including GRE, MAT, GMAT, PRAIS-L, TOEFEL, and NBPTS. Centrally located in the south wing of Clark Howell Hall, University Testing Services also offers a variety of scoring, evaluating and reporting services to university faculty and departments.